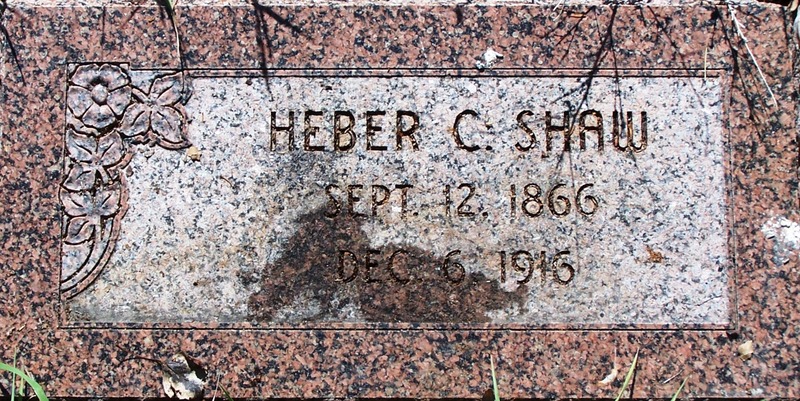 Heber was born September 12, 1866 at Mellor, England, a son of William and Elizabeth Morton Shaw. The family immigrated to Grouse Creek, Utah. He married Sarah Robinson and they had the following children: Eva, Heber James, Gertrude, William Eli, Maud Mary, George Elmer, Bessie, Margaret Ellen and Virginia. He died December 6, 1916 in Ogden, Utah and is buried in the Grouse Creek Cemetery. Heber Shaw ends his life in a home of a friend at Thirty-third and Jackson. Another case of probable suicide confronted the local police authorities this morning, when Heber Shaw was found cold in death in the hut of Jack Sargent, at Thirty-third street and Jackson avenue. The dead man has a wife and a large family of children in Salt Lake City, where he visited them a few days ago. He is a brother-in-law of Brig Robinson and a cousin of Mrs. Elizabeth Boyle of Ogden, and also has relatives in Grouse Creek. His death was due to a bullet that entered his head behind the left ear and penetrated downward. The remains of Heber Shaw will be taken to Grouse Creek, Saturday morning for internment. Friends of the deceased in Ogden will be able to view the remains at the Lindquist chapel Friday afternoon. The mother and one son arrived today to accompany the remains to Grouse Creek.